During the fall season, there are so many family activities and events going on around the country. I thought about adding "visit a haunted house" but I'm a 'scaredy cat'. I keep my eyes closed and buried in the person's back ahead of me so it's kind of pointless. Follow Britney Dearest: His Wife. Their Mommy's board Autumn Eats & Drinks on Pinterest. Follow Britney Dearest: His Wife. Their Mommy's board Autumn on Pinterest. 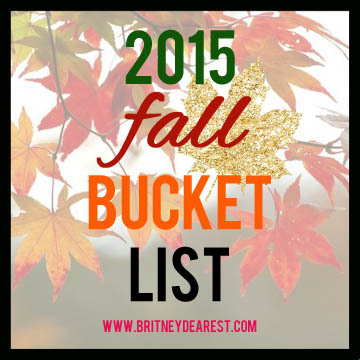 OMG Looking at your list makes me realize I actually am a fan of FALL LOL! I love so many similar things. I hope to go to a pumpkin patch, have fun in some fall leaves, definitely will be dressing up for halloween and making apple cider and watching many of these classic movies!